HCM CITY (VNS)— Many farmers in the Cuu Long (Mekong) Delta province of Kien Giang have decided not to plant a third rice crop this year since it is not very profitable and is often hit by plant diseases. Instead, they plan to flood their fields during that period to benefit from the fertile silt brought by the flood waters. In Tan Hiep District's Tan Hiep A Commune, for instance, the autumn-winter rice schedule got underway more than a month ago, but many farmers have not planted the crop. No member of the 3A Canal Co-operative in Tan Hiep A, which together has 750ha of rice paddies, has planted their field. Nguyen Van Kim, a member, said last year the co-operative planted the third crop and made profits, but some farmers suffered losses because of prolonged rains during the harvest. Farmers did not want to plant the third crop because of the increase in production costs and disease outbreaks, he added. Nguyen Thanh Hinh, head of 3A Canal Hamlet, said local farmers planned to grow five crops every two years rather than three a year so that their fields can be flooded. A third crop caused the growth of lua coi (a kind of wild rice), which could not be eliminated, he added. Many farmers in Hon Dat District too have not planted a third crop. Giang Quang, deputy chairman of Hon Dat, said the district had originally planned to grow the third crop on 8,000ha this year, but farmers had planted only 3,000ha so far. Unstable rice prices and demand were also causing farmers to stop growing the third crop, he said. It costs VND15 -17 million (US$710 - 800) per hectare to grow the third crop, which has an average yield of five tonnes, according to the province's Agriculture and Fisheries Extension Centre. Thus, if the price of the grain falls below VND5,000 a kilogramme, or VND5 million ($238) a tonne, farmers would earn little profit, the centre said. The price of dried paddy in the delta is now VND5,600-5,700 a kilogramme. 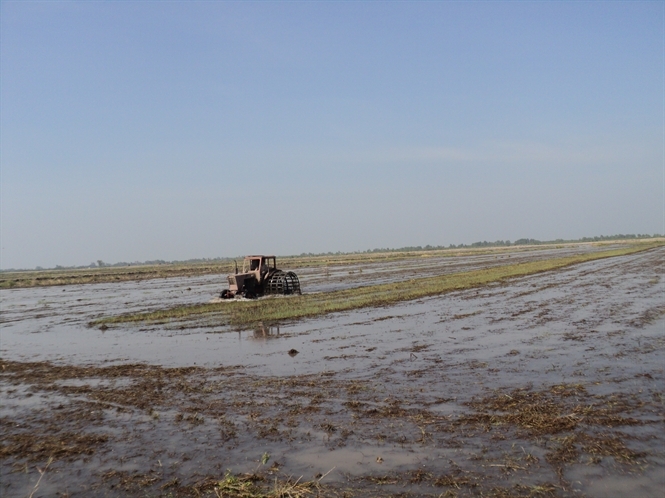 Phu Khi Nguyen, deputy director of the centre, said if farmers grew three rice crops a year, the soil would constantly be submerged under water and, without air, several diseases would break out, including root rotting disease. Rice fields should be ploughed and dried every two years, he said.